Varanasi, also known as Benares, one of the oldest and holiest of the Indian cities lies on the banks of the Ganges River in Uttar Pradesh, India. The seat of North Indian culture for several thousands of years, it is one of the oldest cities in the world which has been continually inhabited. Referred to as the Indian spiritual capital, Varanasi attracts millions of domestic and foreign tourists from all over the world. An uniquely and vibrant 3,500 years old city, Varanasi has been aptly described by Mark Twain in the following words : ‘Benares is older than history, older than tradition, older even than legend and looks twice as old as all of them put together’. The languages spoken in this township are Bhojpuri, Urdu, and Hindi. English is also understood by most of the educated people living in this city. The city derives its name from the two rivers, Varuna and Asi. The favorite city of Lord Shiva, Varanasi is also mentioned in the ancient Hindu scripture, the ‘Rig Veda’, as an important seat of learning. The first settlement in this area goes back to 11th century BCE and according to Hindu mythology it was Lord Shiva who founded this city. It was also home to the twenty third Jain Tirthankara, Parshva in the 8th century BCE and during the lifetime of Gautam Buddha, the city was a thriving center and the capital of the Kashi kingdom. Around 635 ADE , Xuanzang, a Chinese traveler who visited the city noted that, as a throbbing center of cultural and religious activities the city stretched for almost 3.1 miles by the riverside. Qutb-ud-din Aibak who conquered Varanasi around 1194 supposedly destroyed thousands of temples in the city. Even though the process of suppression was continued by successive rulers like Feroz Shah and Sikandar Lodi Varanasi still continued to remain the nerve center of religious and intellectual activity of the middle ages in India. A seat of the Bhakti Movement Benares produced some of the greatest figures of the movement like the singer songwriter, Kabir, and the mystic poet and social reformer, Ravidas. Jean Baptiste Tavernier, a traveler from France recounted the beautiful architecture of the temples in the city. During the reign of Sher Shah Suri a road was built connecting the city to Calcutta, which during the British period came to be known as the Grand Trunk Road. After the death of the great Mughal Emperor Aurangzeb, Varanasi was patronized by a number of Hindu kings and witnessed lots of architectural activities. Most of the remnant buildings which can be seen today were built by the Maratha and the Rajput Kings in Benares, around the 18th century. Probably the most colorful and chaotic cities in the world, Varanasi is sure to offer a unique experience every time you visit this place. 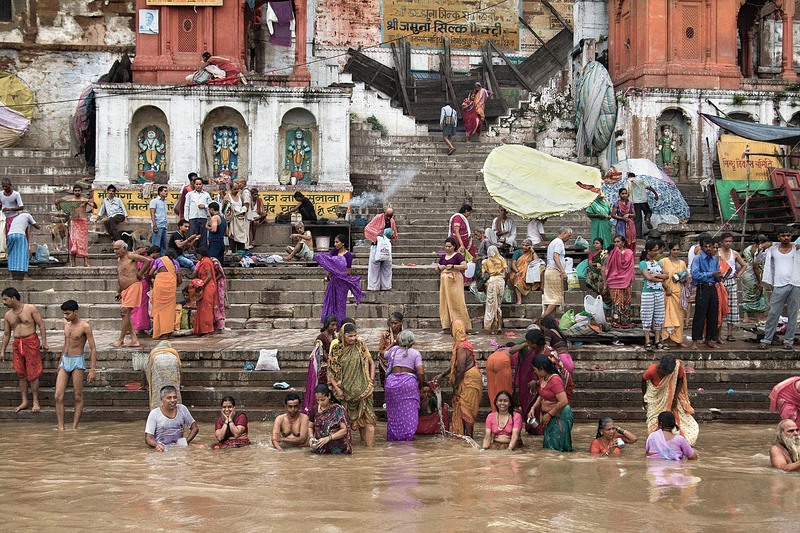 The ancient ghats or river banks which borders the city is a sight to see and presents an odd conglomeration of people- from worshipers to small time traders to hippies and Indian sages. The Dashashwamedh Ghat is the oldest of the 84 ghats of the city where one can witness the spectacular event of Sandhya Arati every evening. There are also 2 other cremation ghats, the Manikarnika and the Harishchandra which are always crowded, not only by the family of the deceased, but also by curious onlookers willing to observe the process of Hindu cremation. 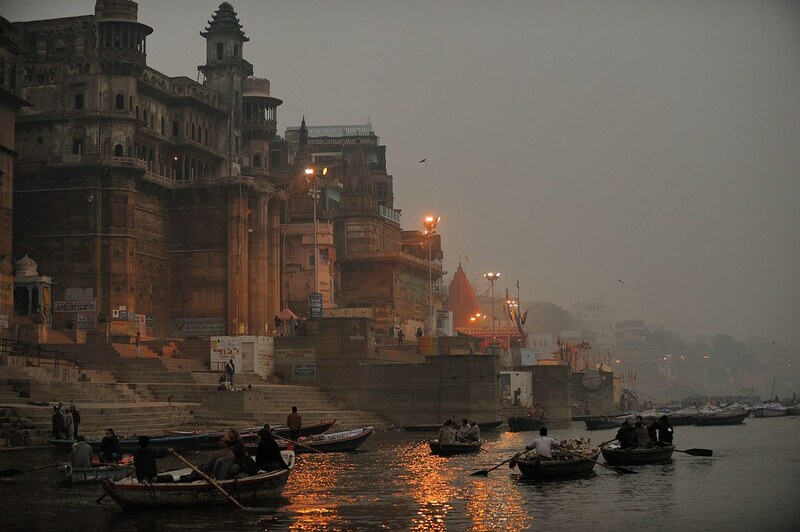 One must take a boat ride in the morning or the evening to properly appreciate the beauty of the ghats of Benares. Varanasi being a very picturesque city, the traveler should never go out without his camera, or else he would miss out a thousand moments those that are meant to be captured. Out of the 23,000 temples in the city the Kashi Vishwanath Temple dedicated to Lord Shiva is the holiest one, which attracts an incredible number of devotees every day. One can also choose to get lost in the narrow labyrinthine lanes of the old Varanasi city flanked on either sided by temples, shops, and ancient houses. 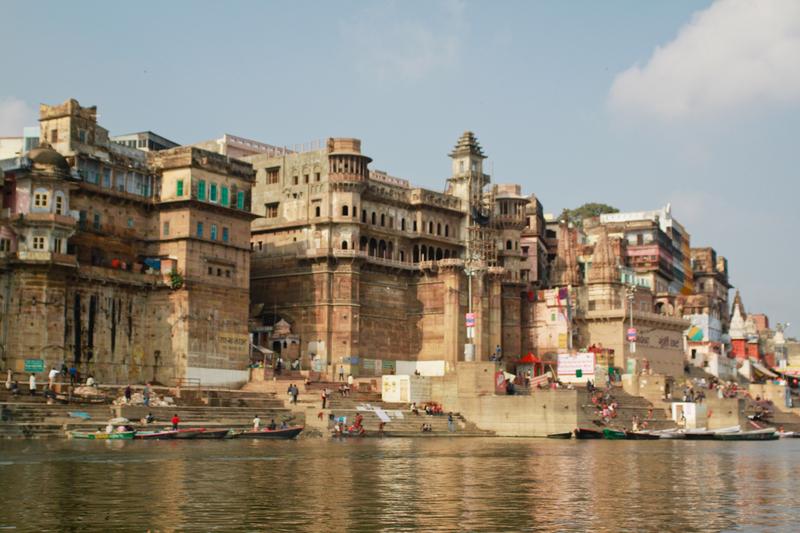 The rich culture of the old Benares city makes it the favorite haunt of the foreign tourists. Tourists can make a day trip to the Ramnagar Fort on the opposite bank of the Ganges that flows beside this township. Made out of sandstone this fort resembles a Mughal architectural style with its ornamental balconies, pavilions and open courtyard. It houses a museum which has been described as eccentric because of its strange collection of vintage cars, weapons, cloaks, and bejeweled sedan chairs. The observatory called ‘Jantar Mantar’, situated next to the Manmandir ghat and built by the Raja of Jaipur can also be an interesting place to visit while travelling within this city. The Mahashivaratri or the festival of Lord Shiva and the Holi Festival are two of the most important festivals of the city which has always attracted tourists from all over the globe. The delicious ‘Bhang Lassi’ (an edible form of cannabis with milk and cream) are legal and available at many street side shops, which is a very popular intoxicating drink, could be a fun thing to try once you visit this ancient Hindu township. 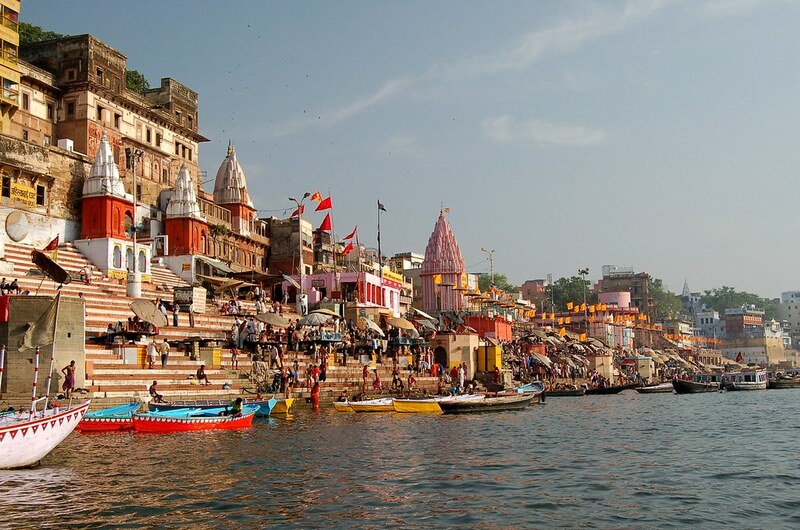 Varanasi is well connected to almost all Indian cities and the nearest airport is Babatpur, about 14 miles from the city. Several trains also run between Delhi and Varanasi on a regular basis. The journey time is approximately 12 hours. Travelers willing to spend a long time in the city might find many cheap places near the Assi Ghat, which is very close to the Beneras Hindu University. One can join a course in yoga, Sanskrit, or go for a training in Indian classical music for which Varanasi is famous since ages. Watch out for the Hindustani Classical music concerts frequently held in the old Benares city. It could be another nice way to spend the evenings in this township. As a note of caution, it is suggested that one shouldn’t stay out very late at night especially on the ghats since there have been many instances of theft and murder of travelers in the past. November to March is the best time to visit Varanasi, since, otherwise, the extreme heat of the Indian summer months coupled with frequent power cuts can be a terrible experience for all travelers visiting this land. Visitors to Varanasi must pay a visit to the ancient Buddhist city of Sarnath which is now in ruins and preserved by the Archeological Survery of India. It’s here where Gautam Buddha supposedly preached his first sermon. Tourists might like to visit the splendid heritage city of Lucknow , which is also an artistic and cultural hub of northern India.